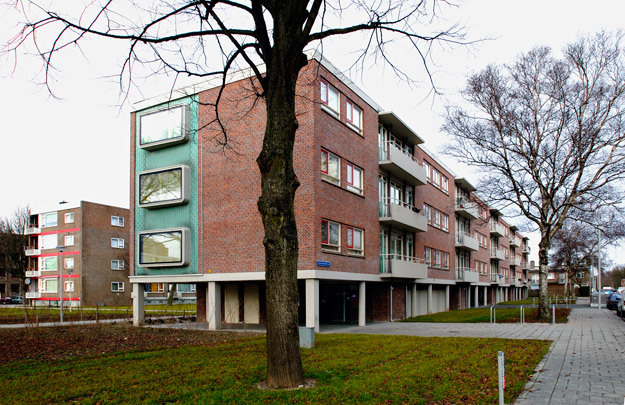 With much of Pendrecht due to be torn down or radically recast in the early 21st century, these units by contrast get a kid-glove renovation. Of particular interest are the head ends with their distinctive 'fish-bowls', large windows held in a concrete frame with rounded corners and set at an angle to the facade, adding momentum to the composition. Another eye-catching element is the vertical panel of sea-green vertical tiles framing each fish-bowl. The building's long sides are of brick enlivened with horizontal bands of concrete and balconies arranged in vertical strips up both sides.